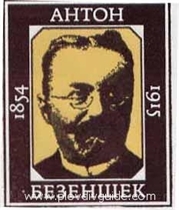 Slovenian pedagogue, stenographer, publicist and public figure, Anton Bezenshek moved to live in Bulgaria after the Liberation in 1878. He was born in 1854, in the small Slovenian village Bukoviye, no far from the town of Tzelle. Bezenshek graduated from Zagreb University and later became a Professor of Philosophy. He became famous for adapting the Gabelsberg?s System of Stenography for the Slavonic languages, and was actually the founder and creator of BG Stenography. Bezenshek came in 1879 to the then Principality of Bulgaria by an invitation of BG government, to work as a teacher in Sofia and Plovdiv, and he also performed as main stenographer of the National Assembly.